Fotos - illustrasjoner 259 fargefotos, 19 tab. The identification of birds from their feathers is one of the rather poorly-developed areas of applied ornithology. This book allows to resolve this problem. This guide presents the feathers of 60 species of bird, of which 38 are included in Annex I of the EU's Birds Directive. In European Union Member States, these species require enhanced protection, together with their biotopes, within the framework of the NATURA 2000 network of protected areas. All of the presented diurnal species of birds of prey (Falconiformes) and owls (Strigiformes) also enjoy protection under the 1973 Washington Convention on International Trade in Endangered Species of Wild Flora and Fauna (CITES). Most of them were also brought under protection by the Bonn and Berne Conventions. 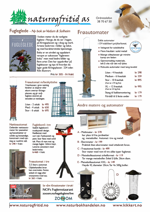 This guide has been prepared for experts as well as enthusiasts for ornithology. Autors: Dr Marian Cieślak, PhD is forester, ecologist and current coordinator of nature protection projects with Poland's Ecofound Fundation. He has been studying the feathers of bird of prey and owls for many years as well as the relevant relationships with species ecology.